Tyler Perry is back on the circuit with his latest installment of his uber-popular character Madea, as she brings in the Christmas spirit as only she can. 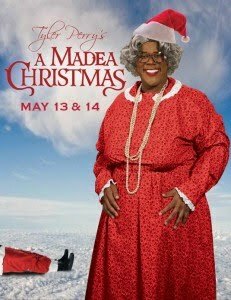 The stage play, A Madea Christmas, is running from May 13th-14th at the Cobb Energy Performing Arts Centre in Atlanta and promises to deliver. 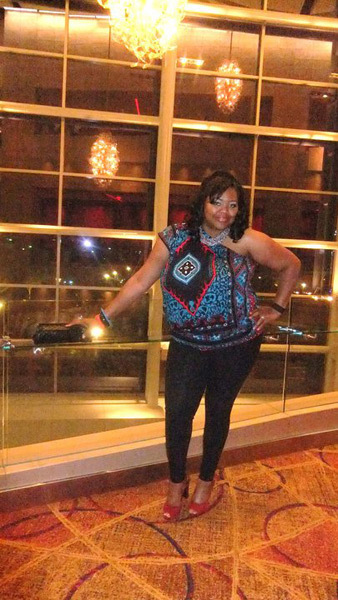 Believe it or not, this is my first Tyler Perry stage play. A BIG shocker, right? It’s true. I’m a huge fan of his movies and DVD’s so I guess that makes up for it to some degree. 😀 Although I’ve never had the pleasure of seeing any of his plays in person, Mr. Perry can be assured that I will be in attendance at his next….front row! The play showcased a new lineup of characters along with Tyler’s veteran cast of actors from his hit movies and TV sitcoms. The incomparable Mr. Brown (David Mann), and the lovely Cora (Tamela Mann) were both in rare form as they delivered their signature back-and-forth banter. Of course with this lineup of characters you know that the play was chock-full of laughs and surprises. But, the biggest surprise was delivered by Tyler when he announced that the show was being taped for DVD release. Yippee!!! So look for it soon, and, if you see me in the midst of the packed house be sure to let me know….a girl can dream can’t she!?. See the complete article on A Madea Christmas. WITNESS Katy Perry’s New Tour Without Concert Tickets!